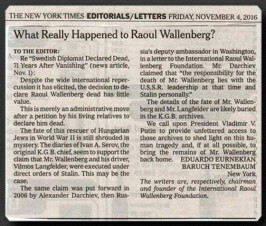 Despite the wide international repercussion it has elicited, the decision to declare Raoul Wallenberg dead has little value. This is merely an administrative move after a petition by his living relatives to declare him dead. The fate of this rescuer of Hungarian Jews in World War II is still shrouded in mystery. The diaries of Ivan A. Serov, the original K.G.B. 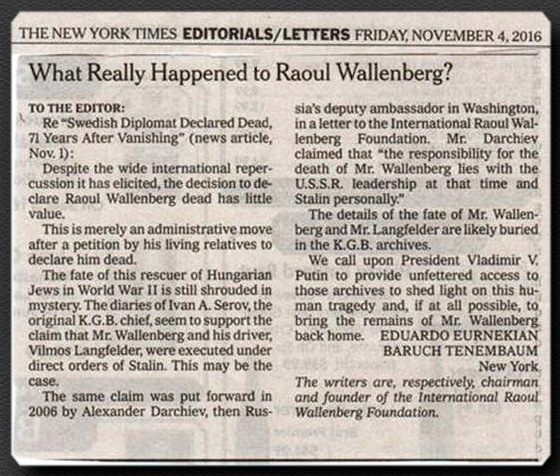 chief, seem to support the claim that Mr. Wallenberg and his driver, Vilmos Langfelder, were executed under direct orders of Stalin. This may be the case. The details of the fate of Mr. Wallenberg and Mr. Langfelder are likely buried in the K.G.B. archives. We call upon President Vladimir V. Putin to provide unfettered access to those archives to shed light on this human tragedy and, if at all possible, to bring the remains of Mr. Wallenberg back home. The writers are, respectively, chairman and founder of the International Raoul Wallenberg Foundation.